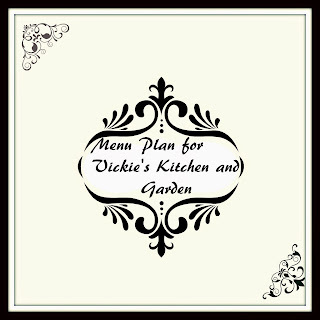 Vickie's Kitchen and Garden: My Menu Plan for this Week 1/28/19! My Menu Plan for this Week 1/28/19! We are expecting a lot of snow here today and school is off. Just a few minutes ago I took a basket, went out to the garage where the freezer is. and filled it up with this week's dinner to thaw. It was full with bread, hamburger, bacon, porkchops, and big turkey that I bought on sale. We are all set! Now if the power will stay on we are good! The kids are on their way over so I can watch them while their Mom works -just for a few hours before we get so much snow she can't come back to get them! Really though we a good either way, I would love for them to spend the night. I love them so! So there are no links to the Chili. turkey soup, and turkey salad but you can find it in my recipe file. I'll try and get back today to fix that. Have a safe warm day -if you are in Australia please try and stay cool!